Today’s Super Shih Tzu Saturday Shih Tzu of the week is Bailey! 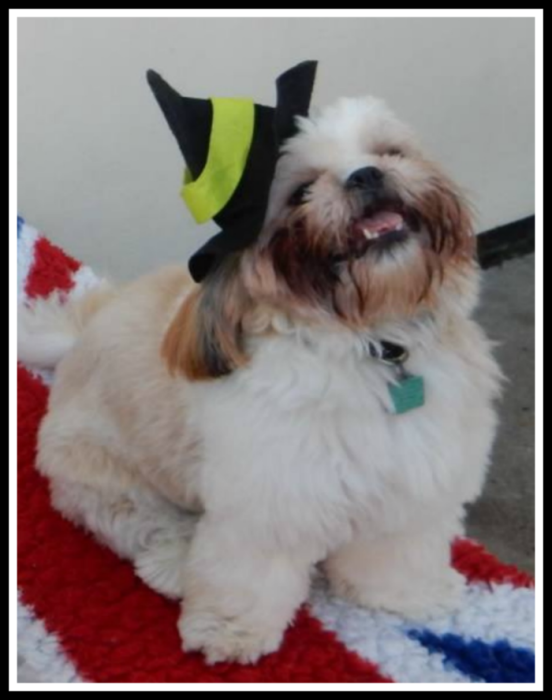 Bailey comes to us from across the pond in jolly ol’ England. I get called Bailey Boo, Mr Bailey and occasionally Imelda Marcos when I’m naughty and take shoes! I’ll be two in September, not long until my birthday! I love my food and treats, I especially love roast dinners Sunday is the best day of the week as it means I get a little bit of what the humans are having. I know the words ‘roast chicken’ as its my favourite and gets me very excited! I love liver treats, gravy bones and if I’m good I can have a little bit of toast and scrambled egg as a special treat . I have a teddy elephant and a little white dog called baby. I like pulling at their ears and tails and carrying them around. I also love my little football, playing ball is the best. I do occasionally get a little bit naughty and take shoes and pull off socks it’s my mischievous side! The beach, I’ve recently moved from London to the seaside and I love it! I’m getting brave now and starting to get my paws wet, its great fun I also love to be up high, I’m not that fond of the floor so sitting on a chair, the sofa or under the TV on the cabinet shelf suits me fine. I also like sitting under tables this doubles up as my hiding place when my face needs cleaned or when it’s bedtime, I run under there and wait for the humans to try to get me out hee hee! Well I was a bit naughty and jumped over the stair gate when I was little. I went upstairs and gave my owners mum quite a shock when she found me! Also I’m a little bit famous I’ve been shown on Breakfast TV here in England. 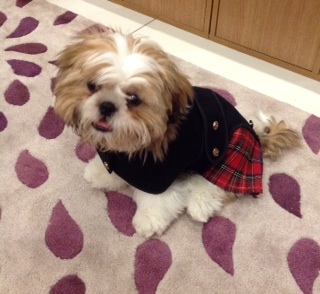 My owner has relatives in Scotland and they sent me a little kilt to wear for Burns Night (Scottish thing I was told). Anyway the presenter of the TV show is Scottish & she loved me in my kilt said I was cute (which of course is true). My family is my bffs. I also have friends when I occasionally go to doggy daycare. I get to meet lots of doggy friends at the beach too. Bailey would sound like Colin Firth. He’s a little gentleman, a true Mr Darcy. Bailey is a great dog very loyal and super friendly. He’s very nosy, likes to explore and loves to be around people. He’s a great companion and is no trouble never barks at other dogs, adores his food and loves nothing more than when he’s on his bed with his favourite chew toy! 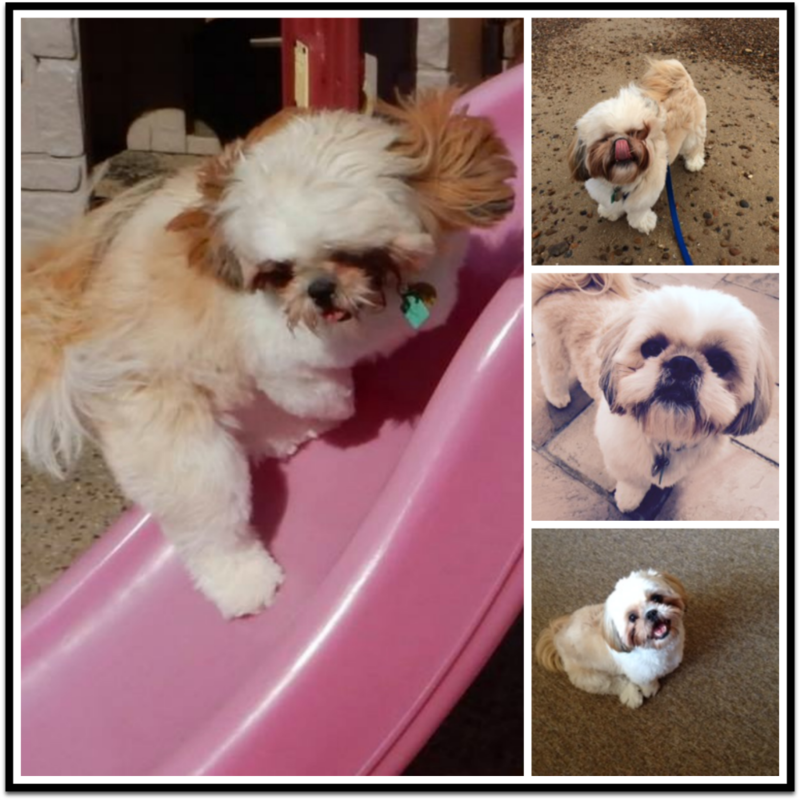 A special Thank You to Bernadette for submitting Bailey as the Super Shih Tzu Saturday Shih Tzu of the Week!